Everyone loves to have beautiful containers of plants around their home and garden and it seems like we all know someone who just has a knack for having great containers. Years of trial and error and access to people with great knowledge in container gardening have taught me a few tricks of the trade. One of the things I love about gardeners is their willingness to share ideas, knowledge, and more often than not plants with their fellow gardeners. In that tradition, here are my tips to getting great containers. You probably already know the typical things. Like, plant sun plants with sun plants and shade plants with shade plants. Choose plants that have similar water needs (no cacti with those water plants.) Choose something that spills over the edge and something with height and something that fills in the middle ground. But do you know the other little things you can do to help your planters thrive? Anything that can hold soil and has a drainage hole can be used as a pot. However, small containers will need to be watered more often. When the temperatures start reaching 97 degrees; in the shade you may need to water a small container more than once a day. If you want easy - large containers are better. Large containers have larger soil volume so the plants won't need to be watered as often. More soil also means your plants can grow a bigger root system. Plants with lots of roots tend to be healthy, happy plants. What kind of material your pot is made out of will also impact how quickly the soil dries out. Clay pots and cocoa fiber/moss lined containers will dry out more quickly than plastic or glazed pottery. Plastic and glazed pots are slower to dry because water doesn't evaporate through their sides. I've already briefly touched on water above and I've written two articles that talk, in depth, about watering container plants. Those articles are: Water Your Way to Happy Plants and Wait, That Plant is Drowning. The basic tips are water your container when the top of the soil is dry to the touch. Water until some liquid comes out of the drainage hole in the bottom of the pot. Be careful not to over water when the temperatures are cool. Keeping soil too wet will cause disease problems. 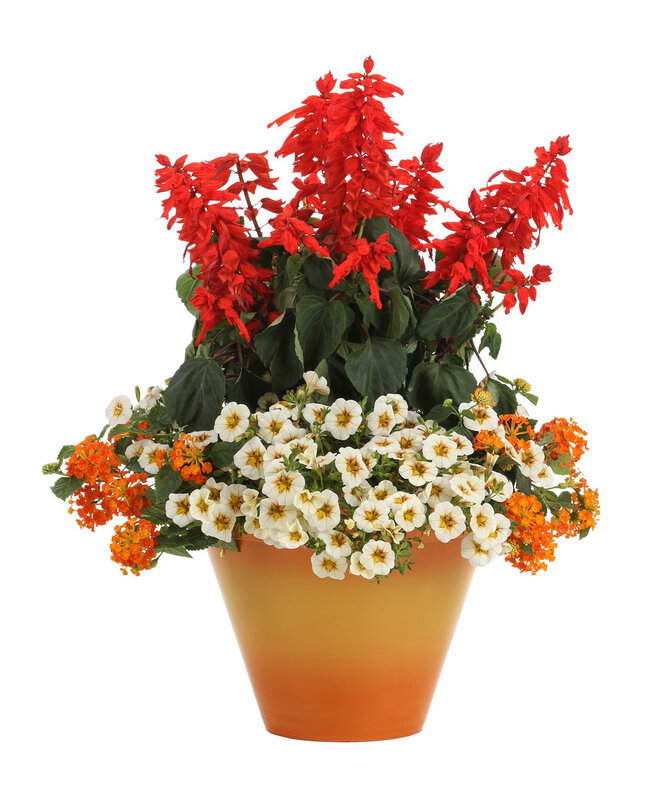 Large pots are especially vulnerable to staying too wet because of their large soil volume. All of that soil makes things easier in hot weather, but it can make things a bit more difficult in cooler weather. Be sure to use a good, light potting medium. Potting soil is formulated to have a good ratio of water holding capacity and air space (roots need air space to be happy). Fill the container completely with soil, leaving some space between the top of the soil and the top of the pot (this is sometimes referred to as head space). In large container gardens, you can leave up to 2 inches;in smaller pots you might only leave ½ inch. I realize that filling large pots with potting soil can be a bit pricey, however, that additional soil volume will really help give your plants a boost. The photo below shows roots throughout the soil of this 18-inch diameter planter. The photo was taken in October, the container was planted in May. A plant with many roots is a happy plant. Pour or scoop soil into your container. Do not pat the soil down, this is unnecessary and will actually negatively affect your plants. Once you fill the planter simply wet it down, gently with water to settle the soil and add a bit more if necessary. One tip to save you time, fill your pot to the top, by the time you plant and then water the plants in, the soil should settle just enough to give you the head space you need in the container. Do you really need to replace all of the soil every year? It is best to replace all of the soil every year, but if last years plants were healthy and you have a very large planter you can replace the top half of the soil with new and leave the bottom half for one more year. Be sure to replace all of your soil at least every other year. If your plants had disease problems the year before, it is best to completely replace the soil. You should also thoroughly clean your container at the end of the season or prior to using it in the spring. This will decrease disease problems. Fertilizer is essential for having the best possible containers of plants. The easiest way to provide fertilizer to your plants is to incorporate a slow release fertilizer into the soil when you plant your container. If you buy an already planted container or if you forgot to incorporate the fertilizer, you can top-dress (spread the fertilizer on top of the soil) with it. 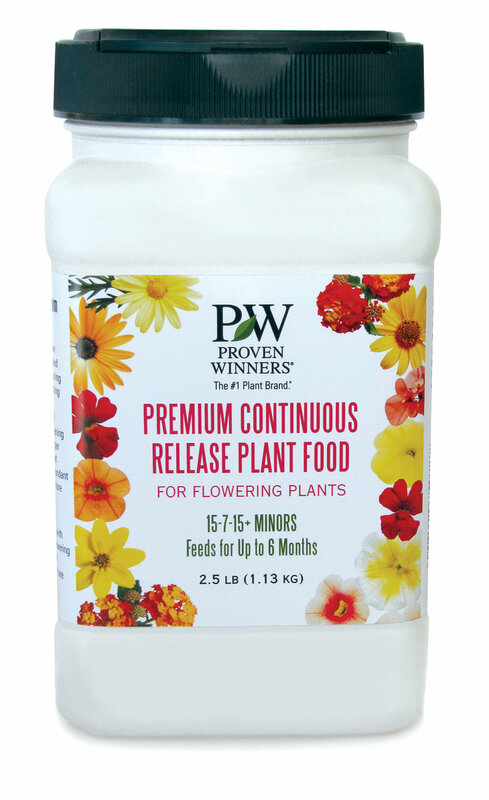 Slow-release or controlled release fertilizers will generally provide nutrition for 2 to 3 months. As your planter gets larger and time goes on you will probably want to augment the slow release fertilizer with regular applications of a water-soluble fertilizer. Six weeks to 2 months after planting, I usually start using a water-soluble fertilizer once every week or so. You can also skip the slow-release fertilizer and use a traditional water-soluble fertilizer from the beginning. Generally, you would apply a water-soluble fertilizer every week or every other week while watering your containers. Read the directions on your fertilizer package for specific application instructions. Your planters will likely grow along doing reasonably well without fertilizer but to maximize their potential you should fertilize regularly. For more information on fertilization, click here. There are two basic ways to plant a combination. The traditional planting and the "living plant arrangement." Traditional planting is when you allow enough room between plants that the containers looks full after 2 to 3 weeks of additional growth. Generally, I would use 3 or maybe 4 plants in 10 or 12-inch planters; 5 to 8 plants in 16 to 20-inch planters and so on. This article has more information on how many plants to use and where to place them within the planter. With the traditional planting you need to have a bit of patience to get a completely full planter. However, the plants will be healthier since fewer plants mean better root growth. Less crowded containers also have better airflow around the plants. Better airflow will help foliage dry faster, which will decrease disease. The living plant arrangement is when you place as many plants as possible into each planter. This allows the container to look full immediately after planting. However, since living flower arrangements are crowded; they tend not to have as much longevity and often have greater disease problems. Living flower arrangements can be really useful if you need to have a high impact container immediately, say for a party the weekend you are planting. One last little tip; if one plant starts to takeover a container feel free to trim it back to give the other plants room to grow. On the other hand, if you are like me, you can let your plants duke it out, a veritable microcosm of Darwin's survival of the fittest. 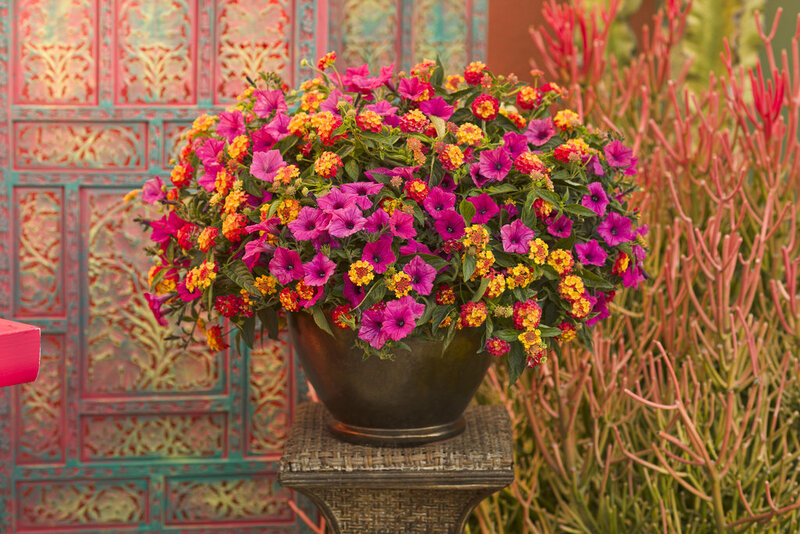 When it comes to caring for containers, hanging baskets have their own special challenges. For information specific to hanging basket care click here. Is this realistic to totally replace soil? I have several very large potted shrubs and trees! I feed often with Fish emulsion as in high temperature zone in which I live I am concerned about high nitrogen fertilizer. If you have perennials and shrubs in containers, then you don't need to replace soil unless your are repotting for some reason. Annuals, which get replanted every year, should start with fresh soil each year. Neighbor dog tromped a bed of bbgum supertunia. Will they come back, should i prune or just chuck them? I would go ahead and prune them. they should come around for you. I would kind of "fluff" them up before you cut them back, just so you don't take too much off. I keep reading that I should plant something in a large container or pot, but what is large ? It is meaningless to me. Large in relation to what ? Is there definition of large and small in the pot world ? What in inches is large or can I work it out in relation to the final plant height or width ? I have no intuititive feeling in relation to gardening and have to look everything up on Google before I pick up a trowel Is there such a thing as scientific gardening as I would really like to garden by numbers and rules as oppose the usal - Large pot. water well, cut back, some sun, part shade etc. I need numbers measurements and rules. Kerry is using 'large' in relation to the plant you intend to put in a container. Here is a good guide that she lays out above as to how many plants to use: "Generally, I would use 3 or maybe 4 plants in 10 or 12-inch planters; 5 to 8 plants in 16 to 20-inch planters and so on"
I have several large pots that I planted the last week or so and realized that Im already out of potting soil - is it ok if I redo the pots using the styrofoam peanuts? 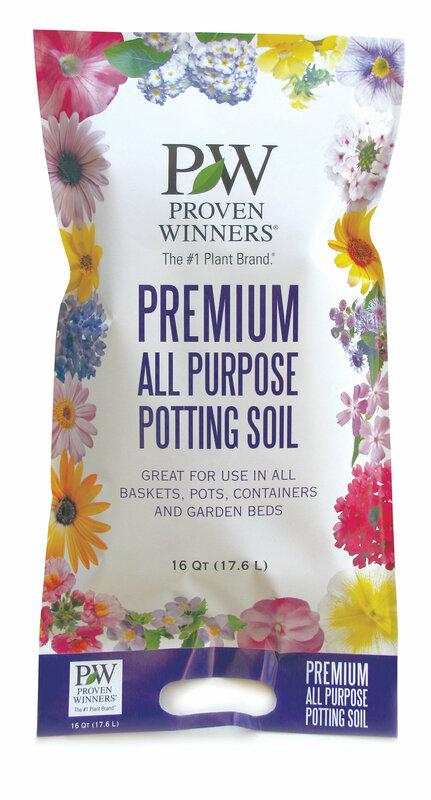 Also, does the miracle grow potting soil come with the fertilizer like above? Or should I add the as well? You can use packing peanuts to use up some space in your pots. I would recommend putting them in some sort of mesh/net bag so water can still drain. As for the potting soil, I would read the instructions/ingredients on the bag. It should tell you if it has fertilizer. I would like to know also. Please let m e know? I've been trying to figure out how I can have plants on my deck. I didn't even think about container gardening! I'll have to invest in some big pots to do that in. Thank for sharing! What are the best planting color combinations for blue pots? I have both sun and shade areas. It depends on your personal taste. This article has a really short intro to different types of colour schemes: https://www.bhg.com/gardening/design/color/using-the-color-wheel-in-gardening/ You can also use the subheadings there in new searches. Don't be afraid to look at art or craft sites to find out more about how colours work together - my garden got way prettier after I worked with different coloured fibres on my spinning wheel! The person recommending lime and pink enjoys a multicolored look so they've gone for the 3 primary colours: blue (your pots), red (pink) and lime (a very yellowy green). You may be like me and prefer a quieter colour scheme for pots with bluer greens and different sorts of blues whites and violets. Or a complimentary scheme like my back harden that's got blues and purples and just enough light yellows to make the purples 'pop'. Look around and see what appeals to you. Have fun looking through garden magazines (try the local library) or google imaging all kinds of gardens to see what kinds of colour schemes you like. You've bought your pots first so you need to factor that blue into your design. Have a look again at the pots to see if they're on the warmer (think in the direction of Cobalt or turquoise) or cooler (grey blues, ultramarine) colours because this will change your pallette. I learned the hard way with wall paint and furnishings that some blues don't go well together. Lime green and bright pink have worked beautifully for me in bright blue pots. Difinitely lime green and one more color. We have our garden in a poastic kiddie pool. It is doing nicely. Hi, I have managed to grow cucumbers, tomatoes, egg plants chilies, ginger, turmeric and herbs among other vegetables in containers on my deck, I have grown papaya in container also but for that I bought dwarf papaya seeds. Just a caution, if you use the practice self-watering pots and live in an area with lots of rain, you might consider either drilling holes in them or using pots with holes. Just remember to fertilize the pots once they start flowering and setting fruit/vegetable. Basicly it is the same as growing flowers in a container, there maybe a few things to take into concideration, such as organic soil and container size. Here is web site that maybe helpful, copy and paste it in your browser. I couldn't get it to link. I didn't know they had water-soluble fertilizer. A friend of mine is planting a tree in a pot until it grows big enough to put in her yard. I'll have to show her a copy of this post. Thanks again! We had a frost warning last night and i brought in most of my patio plants that could be moved and covered the others. I am never sure what is the correct way to cover and protect pots. Some information encourages watering plants that will be covered and I wonder if that is a good idea. Any thoughts on this tough topic. One more night of frost warning and guess it looks good after that where we live... I hope! We recommend covering the plants before a frost. You can use a doubled bed sheet or a light blanket. Make sure the sheet or blanket is not crushing the plant. But that should be good protection from frost for the night! Gardening is an interesting stuff to do but requires space and a lot of people face space problem and they adopt container gardening. This is a better method where you need containers and soil and you can plant trees of your choice. But it is important to choose the containers wisely so that your plant will grow properly and you can get the required results. Big containers are good as the plant root can grow easily and there is no need to water it frequently. I just bought a large, beautiful pot for our deck. I want to make sure it is protected from cracking in the wintertime. Should I buy a fiberglass liner that I can remove when winter comes? In containers that have more depth that a good root system needs, I recycle styrofoam peanuts by putting them in the bottom of the pot and then add the necessary amount of soil. Also, using suggestions previously presented by Proven Winners I tried using perennials in my containers this year. After assessing my regular gardens for plants that were too crowded, in need of a better setting, and/or too plentiful for their setting, I found that I already had lots of possibilities. With a minimum of new annuals, such as Superbells, for instant and summer-long blooms, I am throughly enjoying the new look of my containers. Nice article, I wish that I would have read about the container size before I planted, Is it to late to switch to a larger pot? Great article that puts the basics in layman's terms! I've started wondering about it because I just bought a milkweed and Lantana that I already needed to put in a bigger pot then it came in. My mom wants me to start planting in this box that only holds maybe 8 inches when filled up. I've seen that is great for vegetables, but my mom doesn't want vegetables. It looks like a lot of flowers need at least a foot. Know of any flowers that don't grow big roots?